Nokia brings the Android X factor but will Microsoft be interested? 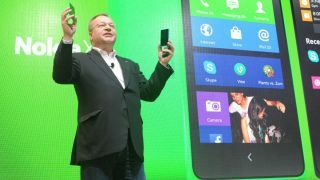 On Monday, Nokia unveiled three new phones at Mobile World Congress in Barcelona, Spain. The phones - the X, X+ and XL - run a "forked" version of Google's Android OS, similar to Amazon's Kindle Fire tablet which leverages the groundwork of Android, overlaying their own custom services on top. The phones are priced conservatively, starting at €70 for the Nokia X and topping out at €109 for the 5-inch Nokia XL, the most high-end phone in the lineup. They are clearly aimed at emerging markets such as Eastern Europe, Asia and South America where Android, and Windows Phone to a lesser extent, are starting to find some commercial success. Praise of Nokia's use of Android may be short lived, however, due to the $7.2 billion acquisition by Microsoft of Nokia's devices business, which will be finalised in the coming weeks. Google and Microsoft are not on the best terms, with Microsoft launching their 'Scroogled' adverts attacking Google services for alleged invasion of privacy, amongst other contentions. Nokia launching a new range of Android phones that are aimed at the potentially profitable emerging markets is unlikely to fill Microsoft executives with joy. Joe Belifore, VP of the Windows Phone division at Microsoft, claimed the relationship between Nokia and Microsoft was "terrific" but added that Nokia will "[do] some things that we may be less excited about." A source who spoke to Business Insider called the phones "embarrassing". At an event also held at MWC, Microsoft unveiled new features present in Windows Phone 8.1 specifically designed for low-end phones in order to make the OS more appealing to emerging markets, as well as dropping the price of Windows to OEMs who wish to incorporate the OS. At first glance it would seem that Microsoft's most logical course of action is to simply kill off the 'X' line once the acquisition finalises. Nokia's engineers and designers can focus wholly on Windows Phone, adding services and features that are not currently available, creating a better experience for users, and by extension making the OS more attractive. However, the 'X' line could potentially catch: Nokia's hardware is attractive and Android offers services and apps that are not available on Windows Phone currently. Nokia's Android "fork" even looks like Windows Phone, with a tile-based design as well as other nods to Microsoft's design vision. Those who have seen the Nokia X have said it is similar in almost every way to the Nokia Lumia 520, and it's unlikely the average consumer will look too closely when purchasing. Indeed, Microsoft could actually benefit from Nokia's experimentation with Android, especially as all profits from device sales of the 'X' range go to Microsoft without having to spend money on building the features Android has and Windows Phone lacks. And there is the little fact that Microsoft actually makes money from Android due to patents, so in some ways the link up is beneficial to both companies. The nice hardware and funky colours of the 'X' range combined with a distinctive operating system and low price could create a market winner, all without Microsoft writing a single additional line of code for Windows Phone. Jumping into bed with Google is unlikely to please Microsoft executives, but the deal benefits them more than it benefits Google. Nokia described the 'X' range as a phone of "Android platform, Nokia experience and Microsoft services" and in a world where Microsoft's services are it's future, having hardware that supports that is no bad thing.